Wiki tells me that “Spinach is thought to have originated in ancient Persia (modern Iran and neighboring countries). Arab traders carried spinach into India, and then the plant was introduced into ancient China, where it was known as “Persian vegetable.” The earliest available record of the spinach plant was recorded in Chinese, stating it was introduced into China via Nepal (probably in 647 AD). In AD 827, the Saracens introduced spinach to Sicily. The first written evidence of spinach in the Mediterranean was recorded in the medical work by al-Razi.” Which kind of makes sense – that it would be in a medical work – because it’s highly nutritional and full of antioxidants. What’s more, there is nothing like the spring baby spinach you find at the farmers’ markets at this time of year – small, tender, and bright green. With a little warm honey mustard dressing and toasted pecans, those Arab traders would think they had died and gone to heaven. Wash and dry (spin) the spinach and set aside. Mix garlic, shallots, dijon, honey, and red wine vinegar in a small saucepan. Heat over medium-high heat and let it come to a boil. Turn the heat down to low and let the mixture simmer for 5 minutes. Remove from heat. Let it cool down slightly and then slowly wisk the olive oil into the other ingredients until mixed well. Set aside. Toast pecans in a small skillet over medium-high heat. Be careful not to burn them but to just toast them until golden brown and fragrant. 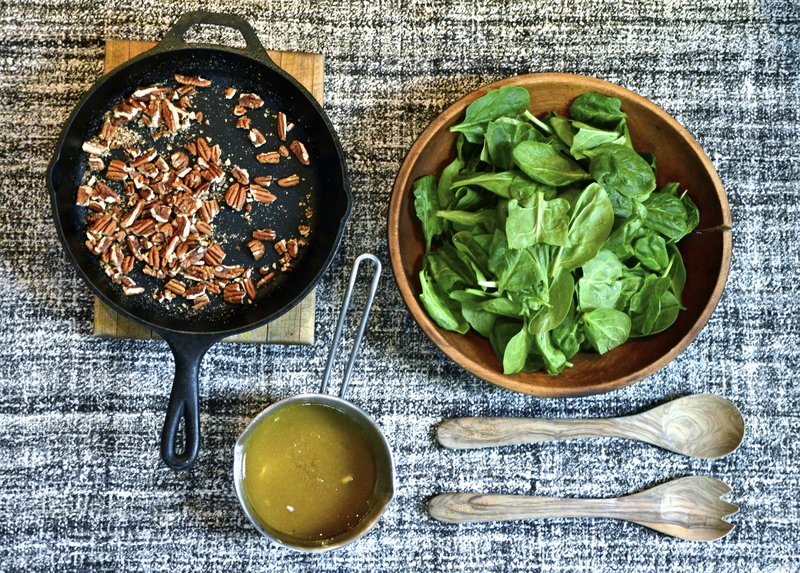 Toss the spinach with a generous dose of dressing. Top with toasted pecans and serve alongside a falafel burger or my favourite VLT. Hey, love your recipes here! Getting some great ideas… But on this particular recipe… well, you might want to replace the honey with Agave or maple syrup… just saying, one vegan to another. Best of luck with the blog. Looks great. Thanks for the note about honey. I do find that one a tough one … I know that technically honey is not vegan but I’ve never claimed to be 100% and in the grand world of veganism I think honey – especially the honey from my organic farmer friends who are truly in touch with this planet and all that’s on it – is one thing I’m willing to sometimes make an exception for. But I take your point that agave or maple syrup would rock this recipe. Thanks for the recommendation and the best wishes! Much appreciated.